An ART shuttle bus with Disneyland Resort livery. 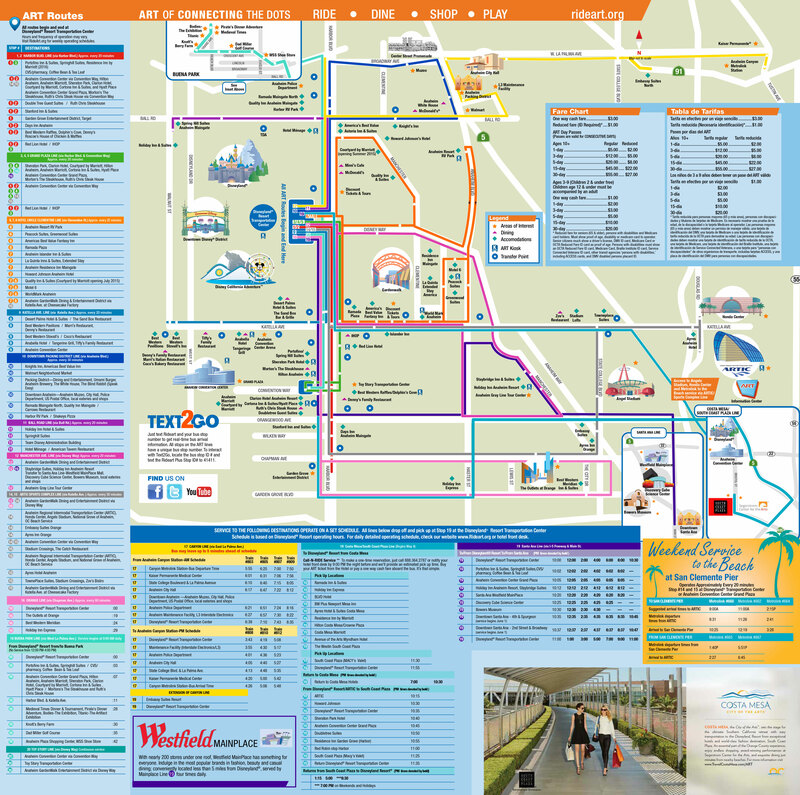 Anaheim Resort Transportation (ART), established in 1998 as the Anaheim Transportation Network (ATN) and formerly known as Anaheim Resort Transit, is a mass transportation provider in the Anaheim Resort area and its environs in Orange County, California, United States. ART uses a fleet of vehicles, including tourist trolleys, to provide access to hotels, malls, and tourist-related enterprises, which are the main destinations connected by the system. In 2005, Citizens Against Government Waste criticized an earmark for ART from the United States Congress as wasteful spending. In 2010, Disney contracted with ART to run shuttles from a Disney-owned parking lot to the Disneyland Resort. ART is owned by the Anaheim Transportation Network, a quasi-government agency organized as a nonprofit corporation. Its board of directors is made up of representatives from hotels, local government, tourist attractions, and other businesses in the Anaheim Resort and Platinum Triangle. Diana Kotler is the executive director of the organization. An ART bus at the Disneyland Resort shuttle area in 2014. As of 2015, ART operates 21 fixed routes with stops in Buena Park, Costa Mesa, Garden Grove, Santa Ana, Orange, and Anaheim. ^ a b c "ART Routes". Archived from the original on July 22, 2015. Retrieved 2015-07-22. ^ "Ride". Anaheim Resort Transportation. Archived from the original on July 23, 2015. Retrieved 2015-07-22. ^ a b c "Anaheim Receives Funding for Resort Transit Service" (Press release). City of Anaheim. December 15, 2004. Archived from the original on 2007-04-19. Retrieved 2010-03-26. ^ a b "A Closer Look at the Anaheim Transportation Network" (Press release). City of Anaheim. December 15, 1998. Archived from the original on 2007-04-19. Retrieved 2010-03-26. ^ a b c "ART Frequently Asked Questions at a Glance". Anaheim Transportation Network. Archived from the original on March 30, 2010. Retrieved 2010-03-25. ^ a b "Routes & Stop Locations" (PDF). Anaheim Transportation Network. Fall 2009. Archived from the original (PDF) on November 22, 2009. Retrieved 2010-03-26. ^ "Transdev to operate Anaheim Resort shuttle". Retrieved 2018-10-18. ^ a b "Contact Us". Anaheim Transportation Network. Archived from the original on March 30, 2010. Retrieved 2010-03-26. ^ "The ART of Getting from Here to There". Archived from the original on March 23, 2010. Retrieved 2010-04-01. ^ "ART Schedule". Anaheim Transportation Network. Retrieved 2010-03-26. ^ "Editorial: Congress' pork diet a matter of concern". Reading Eagle. Reading, Pennsylvania, United States. April 14, 2005. p. B6. ^ Garcia, Sid (March 20, 2010). "Disneyland expansion brings new jobs, parking". KABC-TV. Anaheim, California. Retrieved 2010-03-25. The park worked with the Anaheim Transportation Network and MV Transportation to hire the former OCTA drivers and lease the buses. ^ a b "Timeline". Anaheim Resort Transportation. Archived from the original on July 22, 2015. Retrieved 2015-07-22. ^ "Anaheim transit adds route with stops at Disneyland, South Coast tourist destinations". The Orange County Register. Retrieved 2016-03-10.